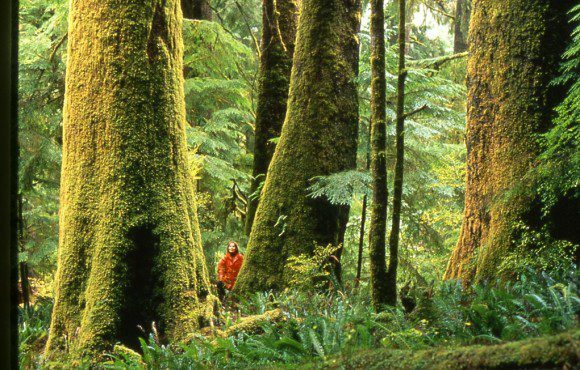 Temperate rainforests, like those of Clayoquot Sound, are globally rare and endangered. On Vancouver Island, which is three-quarters logged, Clayoquot holds the largest tract of ancient forest left, and the island’s only cluster of intact, unlogged valleys. Twenty years ago Clayoquot Sound was the site of major industrial logging. That declined significantly after the 1993 Clayoquot Summer protests, led by Friends of Clayoquot Sound. However, the cutting of Clayoquot’s ancient temperate rainforests has never stopped. The rate of cut dropped to an all-time low in 1998. Since then it has fluctuated upwards again. Virtually all the logs being cut in Clayoquot Sound are shipped out unprocessed, rather than being used here to create local employment. On a positive note, major logging corporations are just about gone from Clayoquot Sound. MacMillan Bloedel used to be the biggest company in British Columbia, but by the late 1990s, following international market campaigns spearheaded by Friends of Clayoquot Sound, their brand had become a liability and they left. International Forest Products followed suit in 2007, selling their Tree Farm License, but they still hold a small Forest License here. The logging tenures in Clayoquot were purchased by five local First Nations, who have formed their own logging company, Iisaak Forest Resources (iisaak is a Nuu-chah-nulth word that means “respect”). 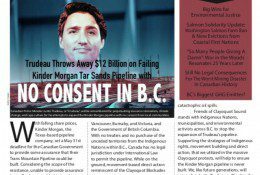 They face serious challenges trying to implement their vision for their homelands within the dominant economic paradigm of resource extraction for profit. In 1999, to help resolve the Clayoquot logging controversy, a Memorandum of Understanding (MOU) was signed between Iisaak Forest Resources and several major environmental groups. A key component of the MOU was Iisaak’s commitment to not log in Clayoquot Sound’s intact valleys. Friends of Clayoquot Sound chose not to sign this MOU because it allowed continued cutting of the ancient rainforest of Clayoquot Sound (albeit in valleys already fragmented by logging). 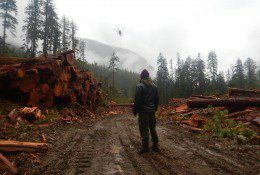 Instead, FOCS took on a “watchdog” role, checking that logging stayed out of intact areas. FOCS has since joined in an alliance with the groups that signed the MOU to work toward a lasting conservation solution for the intact valleys of Clayoquot Sound. » Continue on to Ancient Forests threats.